LIMA, May 15 2009 (IPS) - Microenterprise is an escape valve for social tension at times of crisis, and microbusinesses do a better job of weathering the storm than bigger companies because they are used to overcoming difficulties – a positive effect that is further multiplied when it involves women. “Microbusiness owners have always operated in tough conditions. For them, there has always been a crisis,” Sonia Arenaza, a Peruvian member of ACCIÓN International – a Boston, Massachusetts-based microfinance network involved in Africa, Asia and Latin America – told IPS. “This is a reality that you see in Peru as well as the rest of Latin America and developing countries in general,” said Arenaza. The microfinance expert also confirmed that “during this time of global financial crisis, women who run microbusinesses are doing a better job at withstanding the negative effects, as shown by numerous studies. “They are performing better in financial and entrepreneurial terms,” she said. In Peru, the impact of the global crisis has led to a plunge in exports, spending cuts and a rise in social tension, especially among the poor. Against that backdrop, microfinance takes on a special importance because it channels funds into keeping afloat small businesses, which are a lifeline for the lowest income sectors, said Arenaza. In Peru, which has an economically active population of 10.6 million people, 35 percent of whom are women, there are an estimated three million microbusinesses, which by definition employ five or less people. Microloans are mainly granted in developing countries, fomented by government policies, local and international NGOs, and regulated financial institutions. The Inter-American Development Bank’s (IDB) Multilateral Investment Fund reports that there are 565 microfinance institutions in Latin America and the Caribbean financing around nine million microenterprises, with an outstanding loan portfolio of 9.2 billion dollars, which covers 13 percent of demand for microlending. But the advantages of channeling financial services and products to female microenterprise owners are not limited to times of crisis, said Arenaza. “This has a multiplier effect in terms of development, in first place related to the microenterprise itself and the improvement of its business, and in second place related to the home and the improvement of living conditions for the microbusiness owner’s family, like health and education for the children,” she said. Statistics show that women all around the world are better borrowers, when they manage to gain access to loans, the expert said. But microfinance should also focus on women because they have traditionally been marginalised by lending institutions and because a large proportion of them are among the poorest of the poor. Women’s ability to combine “productive” and family “reproductive” roles in microfinance activities means microcredits to women can have a greater impact, on their families and on society as a whole, in terms of expanding progress and social improvements, Arenaza added. The growing awareness of the importance of microcredit was seen at the fifth Summit of the Americas in April, where U.S. President Barack Obama announced the creation of a microfinance fund to promote development in the western hemisphere. An index called Microscope on the Microfinance Business Environment in Latin America and the Caribbean, carried out by the Economist Intelligence Unit – a specialised service of the British magazine The Economist – and commissioned by the IDB and the Andean Development Corporation, ranked Peru at the top of the list in 2008, pushing aside Bolivia. The ranking is based on three aspects of microfinance: the regulatory framework, the investment climate and institutional development. Peru and Bolivia are followed on the index by Ecuador, El Salvador, Colombia, Nicaragua, Guatemala and Paraguay. In Peru, the number of groups of women who have used microlending to improve their incomes and lives has grown. Rosa Pacheco is one illustration of the trend. She embroiders traditional handbags and purses for Casa Betania (Casabet), a small company that she founded with several other women to generate an income for the poorest women served by community soup kitchens in the slums of the Lima neighbourhood of San Martín de Porres. The Catholic Sisters of the San José del Sagrado Corazón lent the women a locale, and provided advice. A year after the women began to work, they received a donation from Caritas France, which was used to purchase two sewing machines and materials to produce the knitted and embroidered accessories and clothing that the organisation sells at home and abroad. Since then, Casabet has been self-financing, said Pacheco. The women, who are highly skilled in embroidery and knitting, produce sweaters, scarves, purses, vests, ponchos, backpacks and a number of other products, using Peruvian materials, patterns and designs. Their logotype is a feline symbol characteristic of the pre-Columbian Paracas indigenous culture. “We decided to set up Casabet in 2004 because we were already producing and selling our goods, but we wanted to have a more formal business, and to export,” said Pacheco. Casabet belongs to the Warmimaqui (women’s hands, in the Quechua language) network, which groups five workshops in Lima Norte, the northern part of the capital, where the city’s industrial districts, as well as the most populous neighbourhoods, are concentrated. 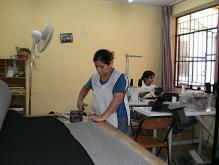 The group’s production is export-oriented, and the company is a member of the Central Interregional de Artesanos del Perú (CIAP – Interregional Centre of Peruvian Artisans). “Through CIAP, our products are sold in France, Belgium and Italy, although as a result of the crisis, the number of orders has plummeted. We also have clients in Australia and Britain,” she explained. From the start, Casabet has been much more than just a company. It emerged as a solution to address the needs of the most vulnerable women who visit several soup kitchens in the neighbourhood of San Martín de Porres. A mental health workshop for victims of domestic violence led the participants to decide to stop being “charity cases” and to seek their own solutions. They discovered that several of them knew how to embroider, knit and crochet, and that realisation gave rise to today’s flourishing export company. “We figured that if we were able to run a soup kitchen, we could manage a company that would offer work and generate funds for the soup kitchens themselves,” Martha Vera, administrator of the Virgen de Nazareth bakery, which is also run by women, told IPS. The poor quality of the bread products received by the soup kitchen prompted the women to think about setting up their own bakery. The initial funding came from two Catholic organisations and Intermón – the Spanish branch of the international aid agency Oxfam – which provided 20,000 dollars. The women used the money to buy a plot of land and build a one-story building. Twenty years later they have a three-story building, modern bakery equipment, and a four-ton truck that is used to distribute their products. The company has two lines of production: enriched bread for breakfasts in public schools, and pastries that are sold to food stores. “We also make fortified bread products for Socios en Salud, an organisation that provides food aid to tuberculosis patients,” said Vera. They have been good at paying off their loans, and representatives of the state and the institutions with which they work have told them that women generally are better payers than men. Of the 200 bakeries producing food for public school breakfasts in Lima, 150 are run by women. “Our children have completed their studies, some of us have set up our own businesses, and we are an example for other women, so we feel very rewarded,” said Vera.